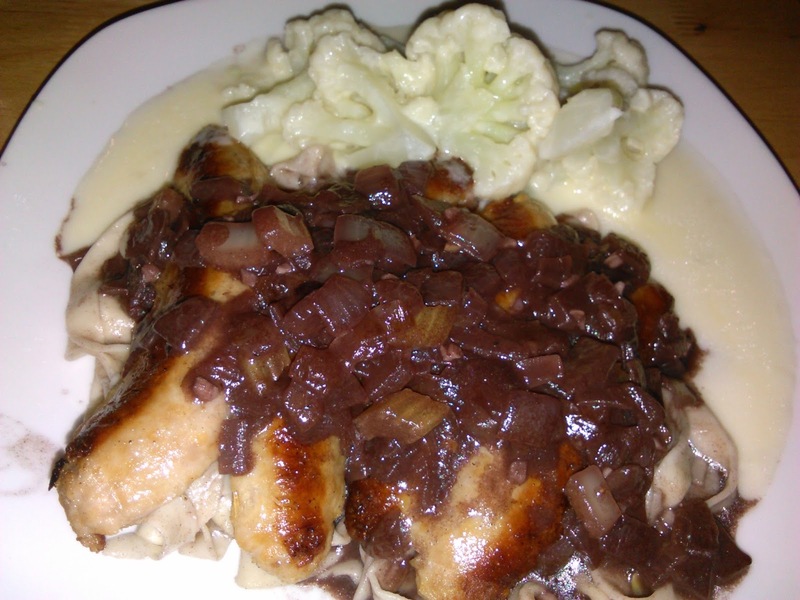 Eat Out In Every Night: Pork Sausage on Fresh Pasta with Cauliflower in a cheese sauce. Pork Sausage on Fresh Pasta with Cauliflower in a cheese sauce. The store made sausages from Mitchell's are a nice inexpensive change. I was going to fry them and serve them on fresh pasta with a red wine reduction gravy kind of sauce. I wanted beans or peas on the plate beside them but cauliflower was half price and I just couldn't pass it up. I originally imagined the cauliflower steamed with grated cheddar melted over the top. That probably would have worked but I was running out of time so I threw together a cheese sauce instead. Somehow I managed to crank out an eggs worth of fresh pasta and cooked it in the bottom of the double boiler the cauliflower was steaming in. I caramelized a couple of diced onions then added a diced celery stick and a few small cloves of garlic. I sprinkled a teaspoon of flour over all and sweated it together . In a sauce pan I put 1.5-2 cups red wine, brought it to a boil and reduced it to about 1/3 volume. I added caramelized onion mixture to it. I added a teaspoon of beef stock powder, a tablespoon of water, salt and pepper. It was a little anaemic so I added a tablespoon of milk for body. A little more instant blending flour on top to thicken it and let that bubble for a few minutes to cook the raw flour taste off. It tasted good but the colour was completely off putting. Maroon food just doesn't look appetizing unless it's borscht. The cheese sauce was butter and flour cooked for a minute then milk slowly whisked in and finally slices of cheddar melted into it. I knew before plating that red gravy mess with cheese sauce is not going to plate well. Fortunately both sides tasted good on their own, they just didn't belong on the same plate. If I had ditched the cauliflower and nuked some peas the plate would at least have looked cohesive and probably tasted better over all. I ate everything on my plate, cauliflower first, then the pasta. The dog ate some of the pasta too so it wasn't too bad. He's super fussy and only eats the best people food. The sausage and pasta tasted much better than it looked and the cheese sauce was great on it's own. If I'd plated the pasta on one plate and put the cauliflower in a bowl and called it cream of cauliflower soup I probably would have had a winner.